The Suffolk dialect has fascinated writers such as George Ewart-Evans and Adrian Bell and yet it is still routinely mangled by well-meaning thespians! They have a good excuse: although the Suffolk dialect is easy to find in print, quality sound recordings are virtually impossible to track down, unless you can navigate your way through professional archives. Suffolk Voices changes this, bringing authentic Suffolk speech to your CD player. Each disc is like a radio documentary, with music, sound and, of course, characters with whom you will love spending your time! Our first Suffolk Voice belongs to Peggy Cole MBE, who became famous in the 1970s for her magnificent village garden. She later appeared in the film version of Ronald Blythe’s Akenfield and although she has given talks in America and on the QE2, Peggy is immensely proud that she still speaks the undiluted accent of her native Suffolk. With contributions from friend Peter Driver, BBC Radio Suffolk’s Lesley Dolphin and Akenfield author Ronald Blythe, we hear her extraordinary and often moving story told in the unique rhythm of the Suffolk dialect. 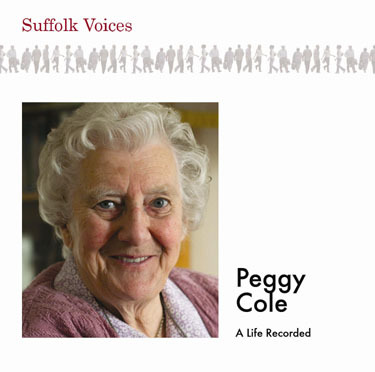 Suffolk Voices: Peggy Cole costs £6.99 including postage and packing. You can order it securely online below. Don't panic when you check out and are asked for your Paypal login. Simply select the "Don't have a paypal account" option which allows you to pay safely by credit card. This CD can also be found in all good bookshops, including all branches of Waterstones in Suffolk (Bury, Ipswich, Lowestoft), as well as the leading bookshops of Woodbridge, Felixstowe, Southwold, Stowmarket, Halesworth and Aldeburgh, as well as Ipswich's Tourist Information Centre and the Framlingham second hand shop. All bookshops can order the CD for you: they just need to look up Suffolk Voices in the Nielsen catalogue. For our second Suffolk Voices CD, we turned to the extraordinary Gordon Knowles. The response to our CD Bungay: Our Town In Sound, which includes Gordon feeding the famous Ditchingham roundabout chickens, was most encouraging, with many demanding a follow up CD. So we felt it only proper to devote an entire disc to this remarkable man. Gordon is now in his late seventies but he still rises before dawn every day to feed the chickens on "Chicken Roundabout", a round-trip of nearly five miles. But besides his love of animals, he is a marvellous raconteur who recalls his life and times in Bungay with a typical Suffolk humour. The CD includes tributes from Bungay shopkeepers, author and museum director Chris Reeve, as well as rare archive recordings of Gordon's mother. 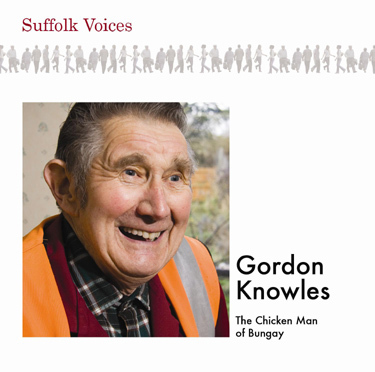 Suffolk Voices: Gordon Knowles costs £6.99 including postage and packing. You can order it securely online below. Don't panic when you check out and are asked for your Paypal login. Simply select the "Don't have a paypal account" option which allows you to pay safely by credit card. The third of the Suffolk Voices series was released late last summer. And it is another cracker! 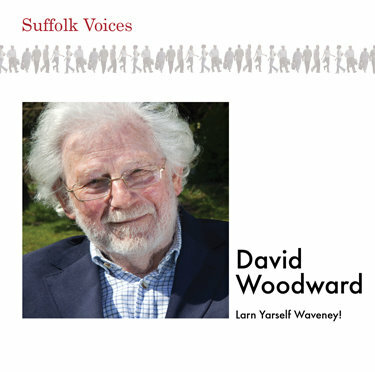 The featured voice belongs to David Woodward, who is much loved because of his radio performances, his dialect readings and his book "Larn Yarself Silly Suffolk." David speaks the dialect of the Waveney Valley, which has a distinctively different sound from that of mid-Suffolk, as typified by Peggy Cole. On "Larn Yarself Waveney" David takes a nostalgic walk around his home town of Beccles, talks about his life in farming, and what it was like working with Keith Skipper and Lesley Dolphin, both of whom add their own generous tributes. But one of the great pleasures of David is his ability to look out of his window and, well, just talk! But mixed in with his effortless and charming conversation are some of David's favourite stories and humorous poems, recited with rare brilliance. Order your own copy here now. Or else check out Waterstones branches in Suffolk. The EADT also found space for this feature on David! 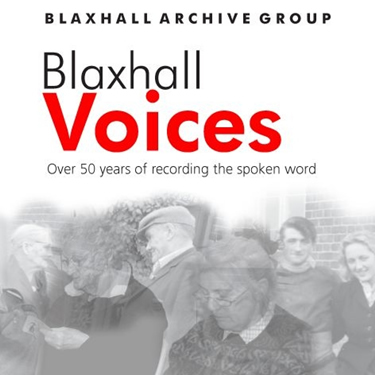 In 2011, we made a CD for the Blaxhall Archive Group that showcases their own extensive sound archive. It was a real privilege for us to be able to include a few of George Ewart Evan's original recordings. We talked to Leslie Dolphin about the CD on Radio Suffolk on Tuesday December 20th, along with the Blaxhall Archive group in the shape of Rodney West and Daphne Gant. The CD costs just 6.99 including postage and packing and can be bought directly from us.